Whew! Cyber Monday was a whirlwind of awesomeness! I hope that everyone stocked up on everything they ever wanted and needed online. ha! Thank you SO MUCH to all of you who placed orders in our Design Shop yesterday, we are working like busy little bee's to get everything printed, packaged and shipped as soon as possible! This week our fabulous giveaway is sponsored by Brightside Prints! Here are some of my other faves! Also, right now, if you become a Facbook fan of Brightside Prints you get 40 FREE LABELS with your next order! I love that, because those little personalized labels really make the whole card/envelope that much more special. 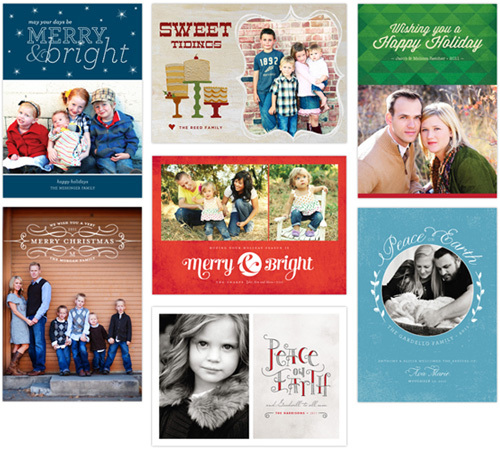 THREE $50 credits to their shop to spend on any invitation, announcement or Christmas card design you choose! Head on over to Brightside Prints and tell me which card design(s) you love, come back here and leave me a comment letting me know! Visit Brightside Prints on Facebook, and "LIKE" them to stay updated on all of the great sales, promotions and new designs that Brightside Prints has to offer. So many fun styles to choose from! Have fun browsing around, I can't wait to see which cards are YOUR favorites! I love the I heart Santa one!!! I love the "holiday map postcard" style! First I love your blog so much! I went over to Brightside and LOVE "Peaceful" Beautiful cards! Thanks so much for the chance to win! And... I now "Like" Brightside on Facebook. I love the Noel Wreath with the yellow and gray! But all the cards are beautiful! I love the chevron baby announcements... if I have a boy! These are all so cute, I think my favorite is merry ampersand, love the red color and that you can use more than one photo. I liked Brightside Prints on facebook. I loved the Sweet Lollipops for my daughters upcoming Candy Land Birthday!! I love the Holiday Map Postcard, seriously, it really stuck out to me, love the colors too! I love them all! But really love the snowflake and I love Santa cards. Love the holiday map holiday card & the Octopirate birthday invitation! I love the Best Holiday Ever card! I love, love, love the holiday map postcard! I especially love the free 40 labels I'm going to be getting with my order. Success!! Thanks for leading me to yet another great business. I love Tree Farm so much I ordered them for my Christmas cards! I have a little boy due in about 5 weeks, so I have my eye on the Chevron Baby announcements. I love the Classic Christmas Scroll! I LOVE the U.S. map card that places a star in the state you are from. That's the one I want to order. I love the Classic Christmas Scroll!! I love the classic Christmas Scroll design. So classy! Sometimes it depends on the photo you have to use but I do love the Noel Wreath, particularly in the gray/yellow combo. Quite fetching! And I "liked" them on Facebook, too! I like the "Filled With Joy" card! I liked Brightside Prints on FB. I love the Holiday Map postcard! We are getting ready to move and it would be adorable to send a holiday/change of address card with this design!! Love it!! I love all of them, especially the I heart Santa...how precious is that! liked Brightside Prints on facebook! I love the "Holiday Map Postcard" design. We just moved and I think it will be the perfect Christmas card for my family! LOVE the peace on earth card!! The Holiday Map postcard is SO creative! I love it! I "liked" Brightside on FB, too! 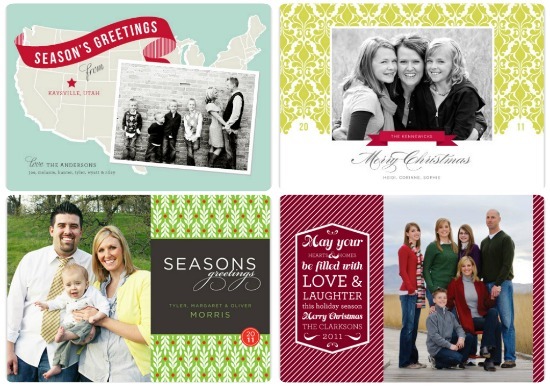 I would love, love the Swirl Border Christmas one! Its is just my style! Hey those are my kids on the blue Merry and Bright card! I am so confused on how they got there, but they look cute anyway. I love the Season of Hope and Peace....such a nice message! I love the Season of Hope and Peace,...such a nice message! love the stacked Joy to the World. So many fun designs! I'm in love with the Holiday Maps Postcard print. Adorable. I also liked this company on FB. What a great giveaway. Love the Snowy Hill. So pretty! I love the modern mistletoe! And now a fan on fb! Thanks! LOVE the classic Christmas scroll! I liked brightside on Facebook too! I love the Sweet Cakes Christmas, too cute! I "liked" them on FB! I LOVE the snowflake monogram! I LOVE the map Post card design! So cute! Just back from the Brightside Prints site and love the "Merry & Bright" design. Super cute design and multiple photos! I like the classic Christmas scroll. Too many awesome options but I love the "Peaceful" card!!! I heart Santa is definately my fav! My fav is the Holiday Map Postcard! I LOVE the linen monogram label. I would love that one. I "like-ed" Brightside Prints on facebook. LoVe,lOvE,love the Classic Christmas Scroll!! Love the Swirl Border Christmas, Snowy Hill and Peaceful Sky. Ooooh, they have so many good ones it is hard to choose just one! It was hard to pick a favorite (or even two), but I like the Snowy Hill design...might even use it for my Christmas cards. I like that it is simple and modern. I also like the Argyle baby announcement. I added Brightside Prints to my likes on Facebook. I love the Sweet Cakes design!! I lovin' Bright & Merry! Gosh darn those are some cute prints! I also liked them on FB too! So hard to pick just one favorite, but I'll have to say Chevron Christmas. These are great cards. I really like the Peace on Earth card. I love the swirl border christmas card and would love to send these out! I LOVE the "Swirl Border" & "classic Christmas Scroll" all so fabulous.....I'm crossing my fingers!!! I like the holiday map postcard. Would love to win this! I like the Holly Berries Christmas card! I like Holiday Map and Snowy Hill card designs. If I win it will be so hard to choose. Merry Ampersand- I'm feeling traditional this year. I like the sweet tidings card! Classic Christmas Scroll is my favorite. Brightside Prints is wonderful. I really like the All Wrapped Up design. Definitely the scroll card. My fave! I love the Noel Wreath! So cute! I love the Sealed with Joy cars! I love the classic Christmas scroll cards!! I love the "Swirl Border Christmas" design. Very classy! Love the "Swirl Border Christmas" design...so classy! I love the Holiday Map Card. I like Brightside Prints on facebook. I love "And Peace on Earth"! I love the Mod Stripes design! I really LOVE surrounded by snowflakes, its so pretty and I have the perfect picture for it! I love the Believe in Magic holiday card!!! So cute! I like the linen monogram look. Thanks for the chance to win! I like the Joy Peace and Laughter card. I have the perfect photo for it too! Thanks for the chance! I love the IKAT Christmas card print. So many wonderful choices. I "Like" Brightside Prints on FB now. i love the retro feel of all the designs, and i think the PICNIC summer invite is the perfect balance of retro modern elegance! I like the "believe in the magic" holiday card. Cute idea with the map card! Love the Holiday Map Postcard and the All Wrapped Up card... too cute! hmm, so hard to choose, the map card, ampersand or christmas scroll maybe...be great to have to make a decision. Just when I was giving up on Christmas cards this giveaway pops up! Perfect timing. Count me in! I love the card with the map. I liked Brightside Prints on Facebook! The Holiday Map Postcard is my ultra Fav!!!!!!!! I LIKE Brightside Prints on FB!!!!!! I love the Classic Christmas Scroll design! I love them all! It was hard to decide, but I think I like sealed with joy the best! Love the card that says, "Season's Greetings from .....". So unique. It was really hard...because I LOVE them all!! But if I have to choose I would pick the Picture Board or Wrapped in Dots. Loved the classic Christmas Scroll and Have a Holly Jolly Christmas. I love Holly Berries and Classic Christmas Scroll cards. I love their bright and merry card! I love the holiday map postcard! My email is kimbrakke(at)hotmail(dot)com. Pick me! magic moments of family time. love the Believe in the Magic, it's so fun and bright! Love, love, love that Holiday Map and the Believe in the Magic. Thanks for posting this. I've been looking for a new card place!! I love the classic Christmas scroll! Thanks for the chance to win. I like the Peaceful Sky card! I love sweet tidings! Adorable! I like the Christmas traditions! It's so nice to see new ideas for card designs! I love them all, but the Peppermint Stripe is my favorite! I Love the "Peaceful" Design!! In love with the swirly border christmas design that simply says, "Merry Christmas," but in a wonderfully classic way! Thanks for this opportunity! I am loving the "Merry Christmas from..." With the US Map, it is just perfect for my newly relocated family! So many fun prints to choose from! I liked them on Facebook! What's not to like! Following Brightside on FB! LOVE! Pick me! I'm in love with the Believe card. LOVE how meaningful that word is at this time of the year. I love the Peaceful and Sealed with Joy designs! I liked Brightside Prints on FB! Love their designs! So many to love, but I think my favorite is the classic Christmas scroll. I like the Little Penguins 2 design. Thanks! I adore Classic Christmas Scroll, Noel Wreath, and Antique Snow! I love the Sweet Lollipops!